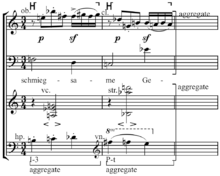 The "first 12-note work": Schoenberg's Op. 23, mov. 5, mm. 1-4 Play . The principal forms, P1 and I6, of Schoenberg's Piano Piece, op. 33a, tone row Play feature hexachordal combinatoriality and contains three perfect fifths each, which is the relation between P1 and I6 and a source of contrast between, "accumulations of 5ths," and, "generally more complex simultaneity". For example group A consists of B♭-C-F-B♮ while the, "more blended," group B consists of A-C♯-D♯-F♯. Hexachord invariance in Schoenberg's Concerto for Violin. Play The last hexachord of P0 (C–C♯–G–A♭–D–F) contains the same pitches as the first hexachord of I5 (D–C♯–A♭–C–G–F). 1 2 Perle 1991, 145. 1 2 Perle 1977, 2. 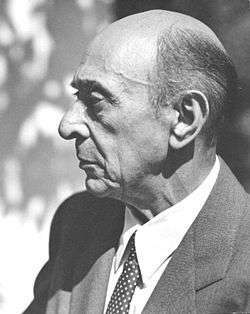 1 2 Schoenberg 1975, 218. 1 2 Perle 1977, 37. 1 2 3 Whittall 2008, 24. 1 2 Alegant 2010, 21.